The new £500m Cabot Circus shopping centre is Bristol’s largest city centre regeneration programme and comprises 120 shops, including 15 major flagship stores in 90,000m2 of retail and leisure space. The development features a spectacular and innovative shell-shaped glass roof over its central area, along with three new streets and vibrant public spaces. The mixed-use development offers visitors 25 restaurants, a 13 screen cinema and 260 residential units, along with car parking spaces for over 2,600 cars. The scheme is one of a series of major redevelopment sites in Bristol, which is designed to help the city centre to compete with out-of-town retail parks, such as Cribbs Causeway. The architects, Chapman Taylor, faced several challenges on this project, including the need to retain existing historic buildings within the design, as well as creating a network of safe, welcoming streets. To attract people back into the city centre from out-of-town retail parks, the development had to provide easy access, but with reduced traffic impact. The client and architect were looking to create a development that demonstrated the highest environmental credentials too, in line with their commitment to reduce its carbon footprint, wherever possible. Cabot Circus was developed by The Bristol Alliance (Land Securities plc, Hammerson UJ Properties). The development has won a series of awards, including the prestigious ‘Best Shopping Centre’ in 2008. Hard landscaping & public realm products have a major influence on the visual aspects of all projects, helping the flow of people between different zones, whilst providing shoppers and retailers with durable, safe, hardwearing surfaces. These were all important considerations at Cabot Circus, not least because hard landscaping was a vital part of helping to retain a traditional high street feel, whilst creating a contemporary new shopping experience. After careful consideration of all the alternatives, Gwrhyd Pennant Sandstone from Marshalls’ Natural Paving Stone range and Flame Red Granite were specified to create the main walkways within the centre. 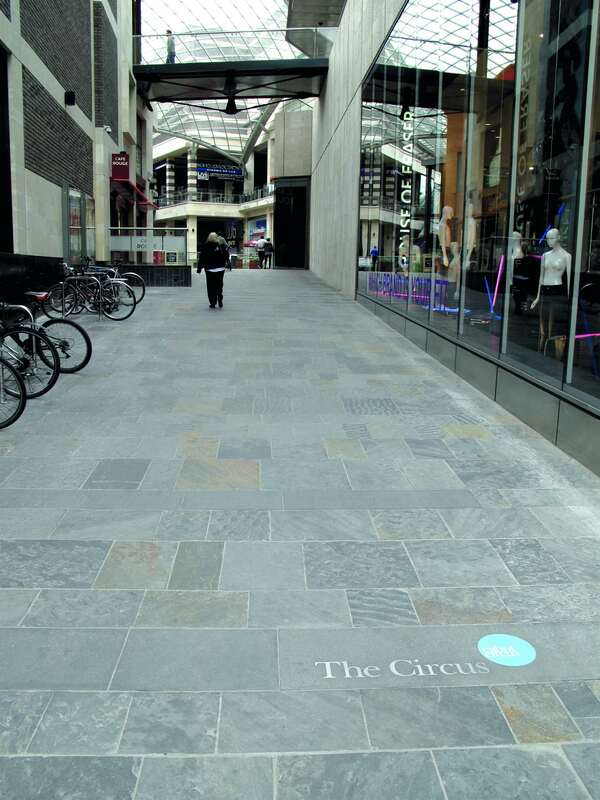 The architects chose Gwrhyd Pennant Sandstone, because it helped to realise their original design concept for Cabot Circus. This was to replicate a section cut through the topography below Bristol itself, which has a lot of naturally-occurring Pennant sandstone. Indeed, numerous buildings, walls and bridges in and around Bristol are constructed of Pennant Sandstone, which contributes to the local character of the area. Gwrhyd Pennant Sandstone is now quarried by Marshalls’ site in South Wales. As a paving material, it provides impeccable performance requirements, including the ability to carry higher loadings and forces than other paving materials of the same thickness. Gwrhyd Pennant Sandstone can be used in most pavement applications without risk of failure or damage. “We specifically choose Pennant Sandstone from Marshalls because it is a material that has been used for centuries in and around Bristol,” said a spokesperson for Chapman Taylor architects. “We were delighted to find that it is still available from Marshalls at its quarry in Wales, which had the added advantage of reducing carbon miles on this Gwrhyd Pennant Sandstone Paving Woodhouse Bespoke Signage www.marshalls.co.uk/select development, due to its relative close proximity to Bristol.” Riven faced was chosen from the Gwrhyd Pennant Sandstone range at Cabot Circus to retain the natural appeal of the grey through to red colour variation. Marshalls’ Sandstone ranges are also available as a Smooth sawn or as a Rustic finish. 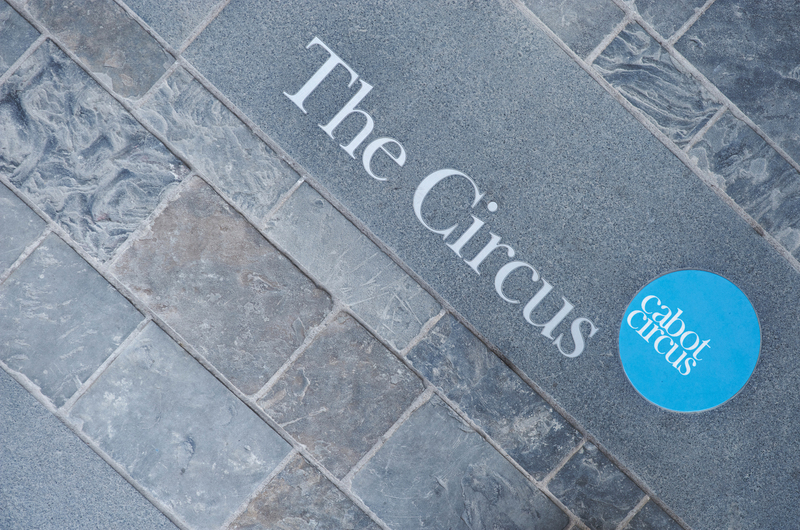 Gwrhyd Pennant Sandstone from Marshalls was specified within the heart of the shopping centre development. For the steps on the sweeping staircase under the central glazed area, Flamed Red Granite from Marshalls was specified, which also ran the length of the central street. Ravenswing Black Granite was chosen to define the edgings of the granite paved areas, again from Marshalls’ Natural Stone Paving range. Granite Hazard Warning Tactile Paving helped to draw attention to areas such as steps and slopes. “We have been extremely impressed with the quality of product and service provided by Marshalls,” explains Chris Bolderstone, Commercial Manager of Sir Alfred McAlpine. “This is a prestigious project that will revitalise the centre of Bristol and the new hard landscaping areas really add to the overall appeal of the development.” In addition to the provision of high quality natural stone paving, Woodhouse Projects, a Marshall’s Specialist Business, supplied seating, signage and lighting for the new centre. This included two high profile lighting features, which play an important part in establishing the centre’s distinctive identity. 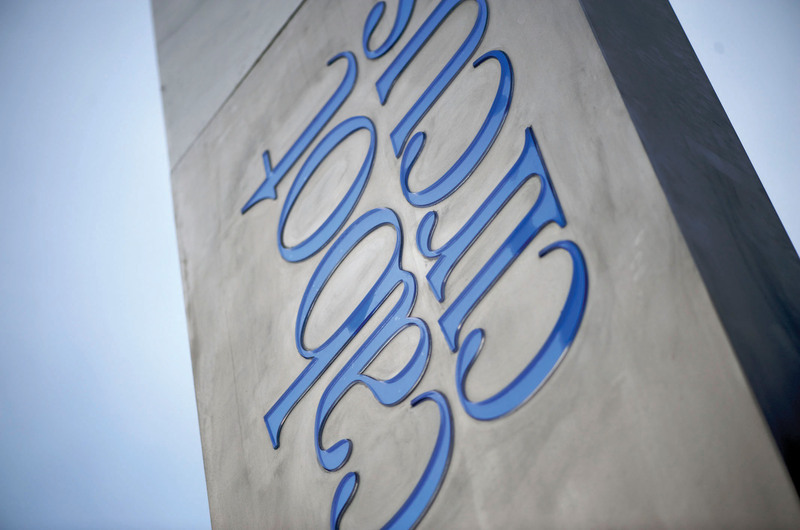 Use of Marshalls’ Gwrhyd Pennant Sandstone helped meet the client’s brief for creating a modern, vibrant city centre development that still retained links with the existing historic buildings, which are built from the same stone. Recreating a topological representation of Bristol by careful choice of hard landscaping materials has created an enduring and powerful link with this historic city. 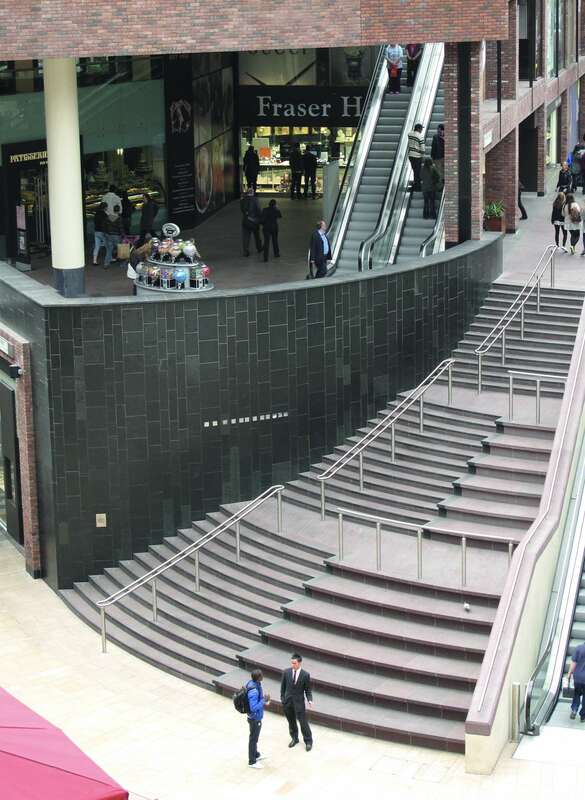 The fine grained Sandstone paving combines superb technical performance and aesthetic appeal, providing a long term low maintenance solution for this prestigious shopping centre. 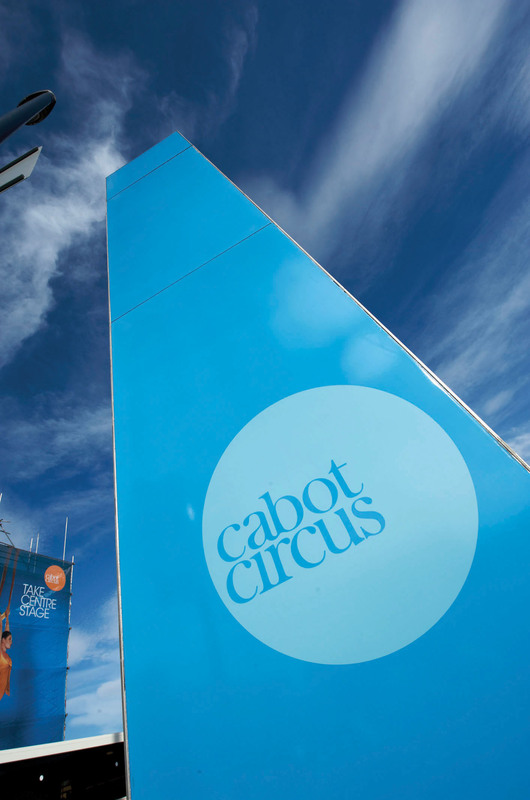 Since opening, Cabot Circus has attracted visitors from across the South West, Wales and beyond. Cabot Circus is the first major shopping centre to be rated as “excellent” under the BREEAM scheme – the construction industry’s highest environmental accolade. It won this prestigious award through use of locally-sourced materials, wherever possible, as well as incorporation of a high percentage of recycled materials and by having 70 per cent of its construction workers living within 25 miles. The project has scooped several major awards for its innovative design and construction, including ‘Best Shopping Centre of the Year 2008’ by the British Council for Shopping Centres (BCSC). It was commended by the Judges: “the attention to detail throughout the scheme is exemplary and is seen in the design detailing, the artwork, the shop fronts and the customer facilities.” Cabot Circus also beat an international shortlist to win the coveted Best Shopping Centre of the Year award at the prestigious MAPIC EG Retail Awards. Judges said of the development: “It has changed the entire city and for one shopping centre to do that is quite an achievement.